CEDARVILLE — Cedarville University Yellow Jacket senior Carly Rose earned a spot on the 2017-18 Google Cloud Academic All-America® Division II Track & Field/Cross Country Team. The Baltimore, Ohio native and Fairfield Union High School grad was named to the second team. The team is selected by the College Sports Information Directors of America (CoSIDA). A Management Finance major, Rose was among 19 of the 45 all-academic women’s selections to hold a perfect cumulative grade-point average of 4.00. Rose was a five-time All-Great Midwest Athletic Conference track performer in the relays both indoors and outdoors. She teamed with junior Olivia Esbenshade, and sophomores Sarah Hoffman and Carsyn Koch to set the school record in the outdoor 3,200-meter relay with a time of 8:59.84 at the Texas Relays. That group was recognized as an Accusplit Relay of the Year recipient as well. Rose was a three-time National Christian College Athletic Association (NCCAA) All-American on the track. She was the 2018 NCCAA indoor mile champion (5:12.01) and was a member of Cedarville’s winning distance medley relay squad (12:28.39), with Rachel Sweeney, Hanah Johnson and Grace Norman. 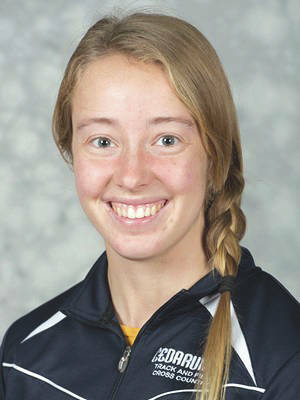 A four-year cross country runner, Rose was part of the NCCAA title team placing 22nd in the 5K in 19:12. She was a Dean’s Honor List student and earned a spot on the G-MAC Academic Team. Rose is the fifth Yellow Jacket female track and field athlete to garner CoSIDA Academic All-America® recognition. She joins Samantha Maat Modderman (2007; second team), Lydia Wong (2010; second team), Esbenshade (2017; first Team), and Koch (2017; first Team) in the elite group. Information courtesy of Cedarville University Athletics, yellowjackets.cedarville.edu .